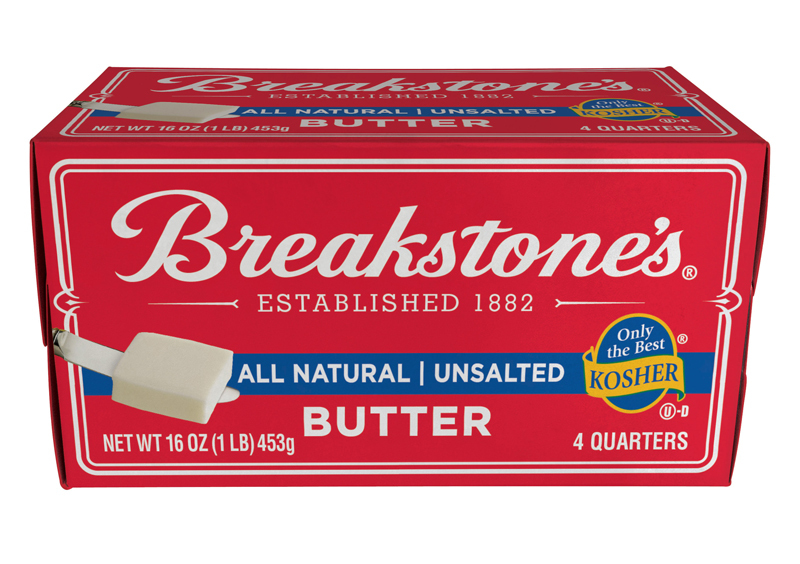 Breakstone’s® Butter is made with the best ingredients for a creamy, rich taste that meets the highest standards of kosher quality. Salted butter is a good choice for cooking and is generally preferred for table use. Choose unsalted butter for baking, preparing seafood and for any situation where controlling salt content is desirable. Whipped butter is light and fluffy and is best used as a spread. Set butter out of the refrigerator for 15 minutes before use for best spreadability. Lightly salted, perfectly spreadable and ideal for a variety of foods. 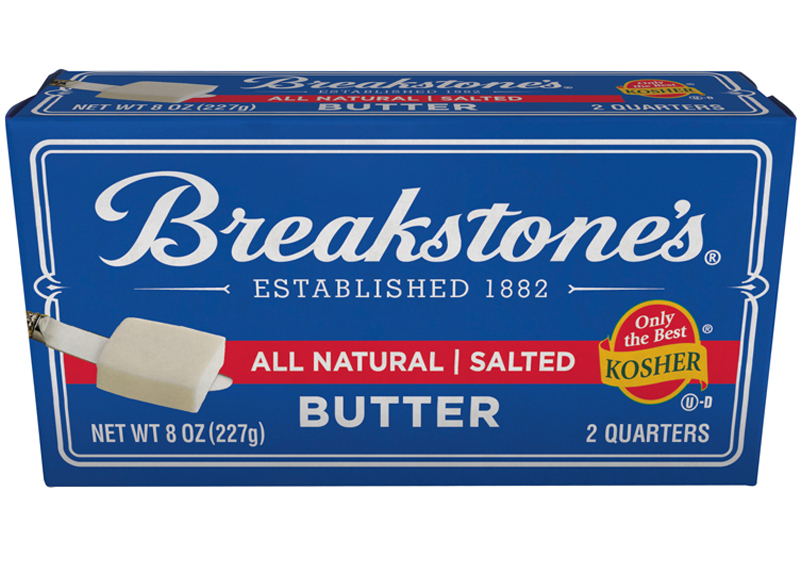 With great ingredients and Breakstone’s® creamy, high-quality kosher butter, it’s easy to bring your family together to make great meals and happy memories. Start celebrating traditions new and old, whether it’s at the dinner table or in the kitchen. What is the definition of butter? Butter is a food product made exclusively from milk, cream, or both. It can be made with or without salt, and contains at least 80 percent milk fat by weight. It is a dairy product made by churning until it reaches a semisolid state. What are the different types of butter? Salted butter – Perfect for general cooking, it contains less than 2% salt. 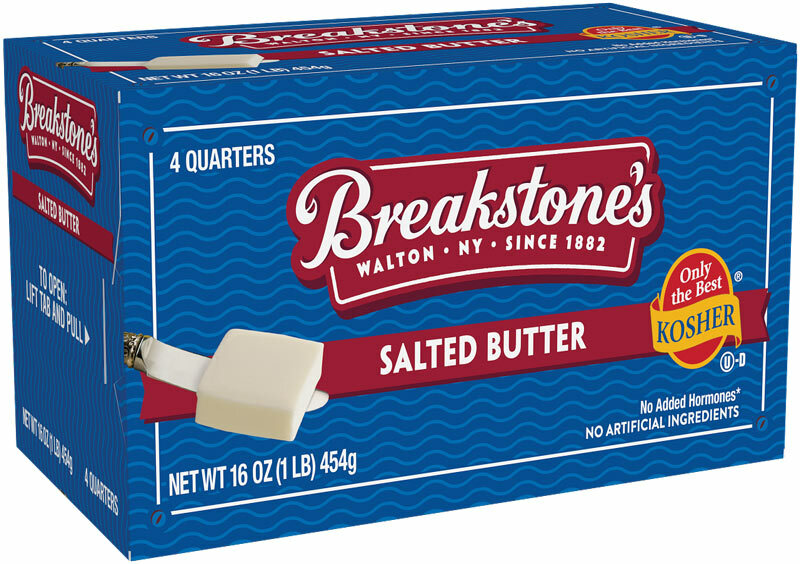 Unsalted butter – Preferred for baking, creating flaky crusts and sweet treats with great taste and texture. Whipped butter – Regularly 80% salted or unsalted butter that has air whipped into it, resulting in a product with greater volume, reduced density and improved spreadability at colder temperatures. Clarified butter – Made when butter is melted and the milk solids and water are removed. Less water means no splattering and the removal of the milk solids give clarified butter a shelf stable life of up to six months. How should I soften butter for table use? In general, butter needs to be just slightly above 60°F to be able to spread on something soft like bread. Whipped butter spreads easier than stick butter due to the product being whipped. Neither a solid stick nor whipped butter will spread easily right out of the refrigerator. We recommend allowing the butter to sit at room temperature for 15-20 minutes before spreading. 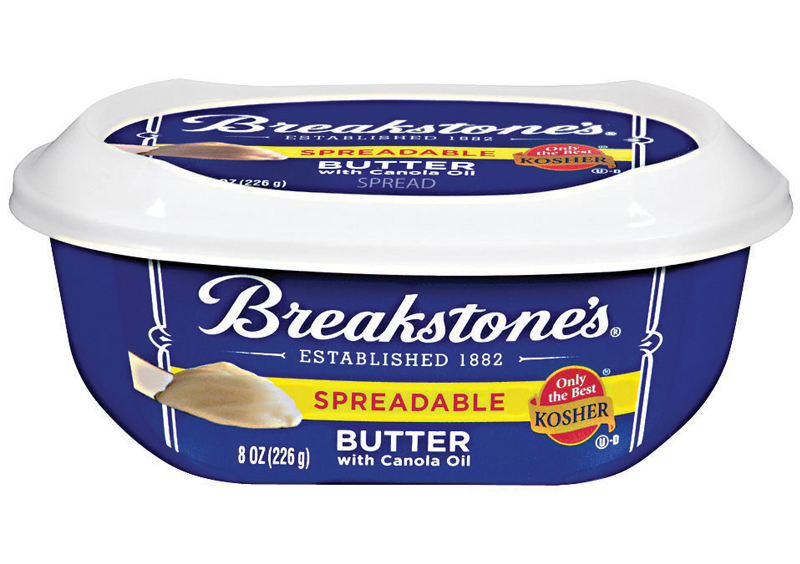 Try our Spreadable Butter with Canola Oil for easy spreading right from the refrigerator. Should I use salted or unsalted butter for recipes? Salted butter is best for general cooking. Unsalted butter is preferred for baking, creating flaky crusts, and sweet treats with great taste and texture. How should butter be stored? Butter should be kept refrigerated at 45° F or less. Store it in its original container in the coldest part of the refrigerator, not the warmer “butter keeper” on the door. Store it away from foods with a distinctive odor like cheese, onions, garlic, etc. Can butter be frozen and used at a later date? Butter can be frozen for up to four months after the “sell by” date if frozen when fresh. Butter should be placed in freezer baggies or other air-tight containers. Once thawed, butter should be used within a few weeks. We do not suggest freezing whipped butter as it can change the texture of the product. How do I measure butter? Butter is made from non-gluten containing ingredients. Is Breakstone's® Butter made with artificial growth hormones such as rBST or rBGH? 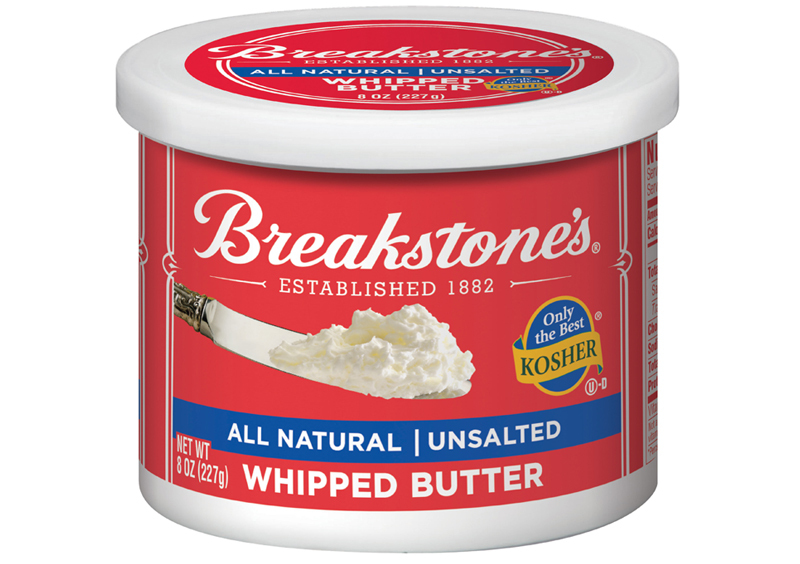 All Breakstone’s® products are made with milk from cows not treated with artificial growth hormones. No significant difference has been shown between milk derived from rBST treated and non-rBST treated cows. Do you sell Kosher Butter? All of our branded items are certified Kosher by the Orthodox Union year round. We also have Kosher For Passover available in our Breakstone’s® brand. At that time, the packages are marked as such. What does the date on the butter signify? The date on butter is the “use by” date. 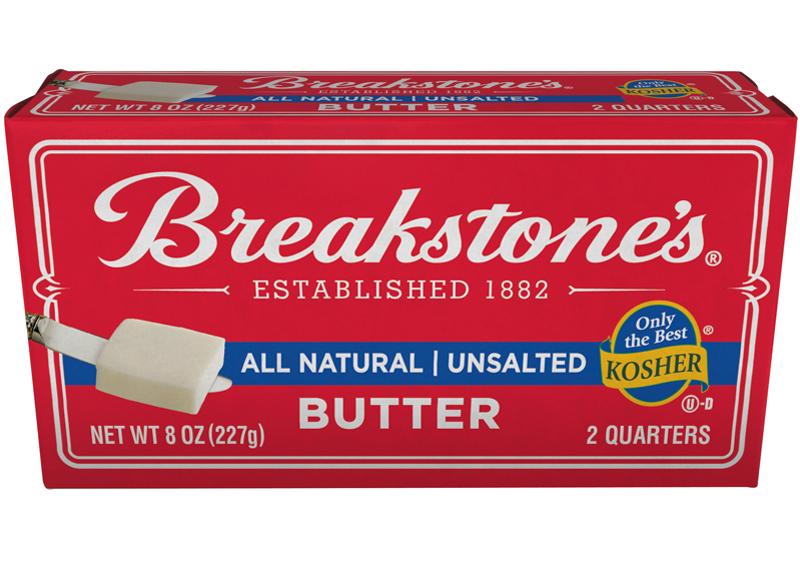 Find Breakstone’s® butter products at a store near you. Store locator will be available soon.